Speaking of "Healthy Meal", most people will shy away because it is often seen as "boring" or "less delicious". 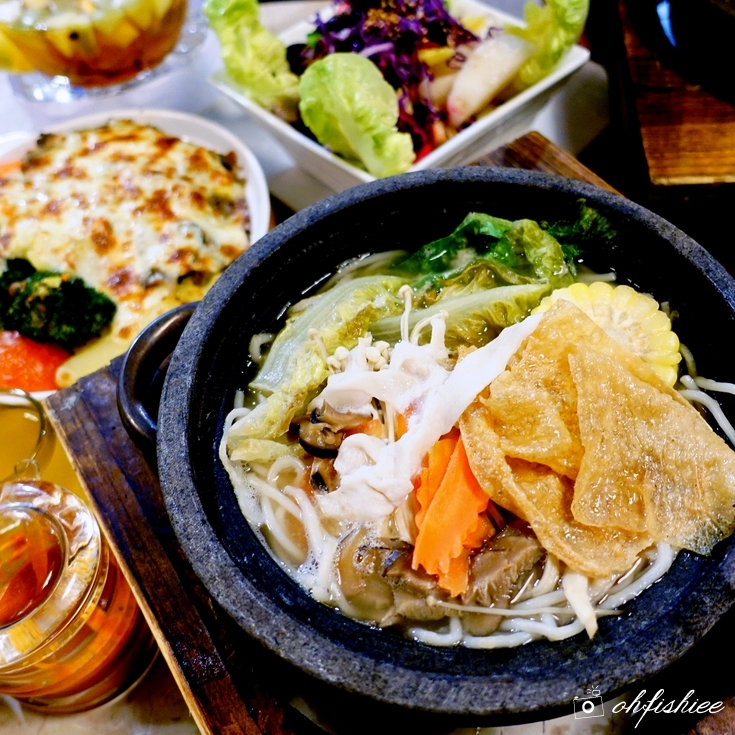 But at Mama Kim Restaurant, things are totally different as Chef Mama Kim herself loves innovating with new healthy recipes to keep the food delicious yet balanced in nutrients. 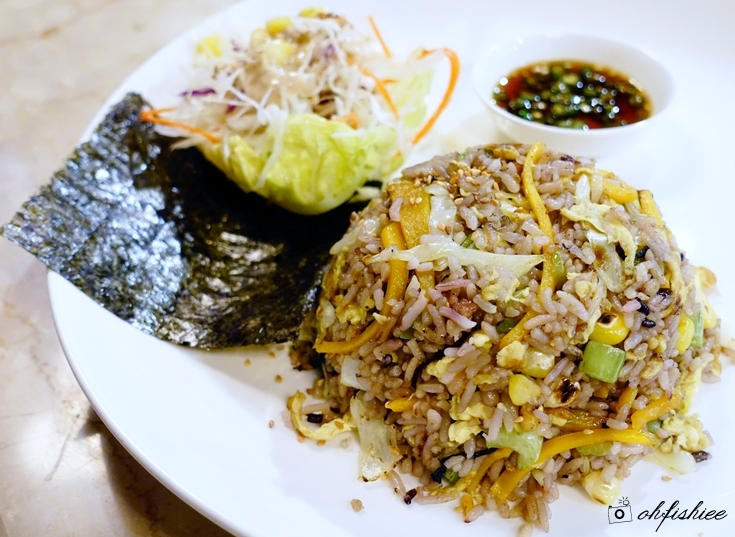 Mama Kim Restaurant has been a favourite spot for healthy goers who believe in balanced diet that incorporates real food with low salt, no white sugar, no white flour, less oil, and no MSG. 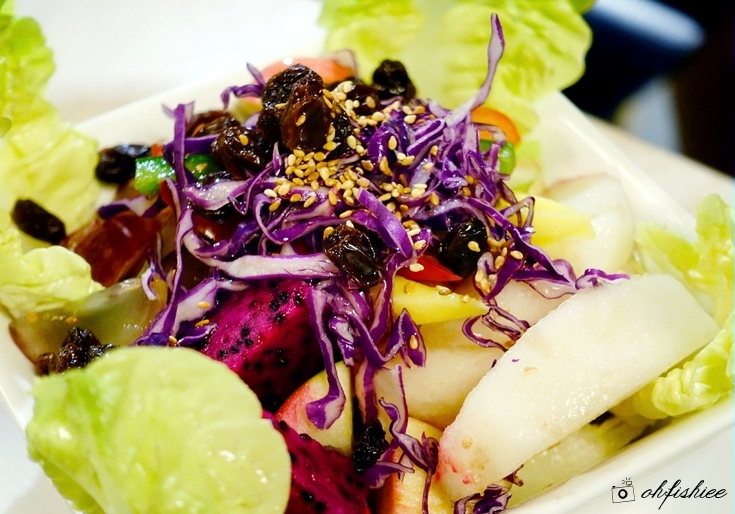 It practises the concept of 80% Vegetables and 20% Meat in each dish, to keep it healthy and tasty. It's time for a change of lifestyle! Speaking of the ambiance, you can dine comfortably under a modern warm setting. But do expect to queue during weekends, otherwise you should come early to secure a nice table for you and your family or friends. The beverages here are mostly healthy and natural. 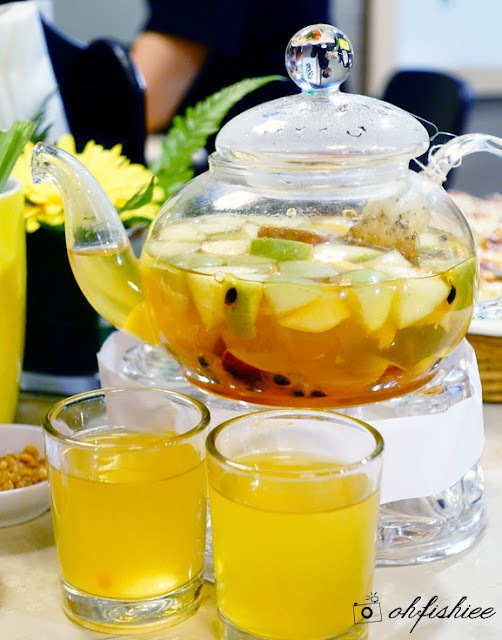 Our jar of fruity flower tea infused with apple, orange and passion fruit is great for sharing among 4-5 persons, but I can easily enjoy it all by myself because the citrusy taste is so natural, refreshing and sweet! Another healthy option is the blended vegetables juice, definitely a great source of fibre to improve digestion! Alternatively, the soothing lemongrass and longan drink are equally good for the overall wellbeing. 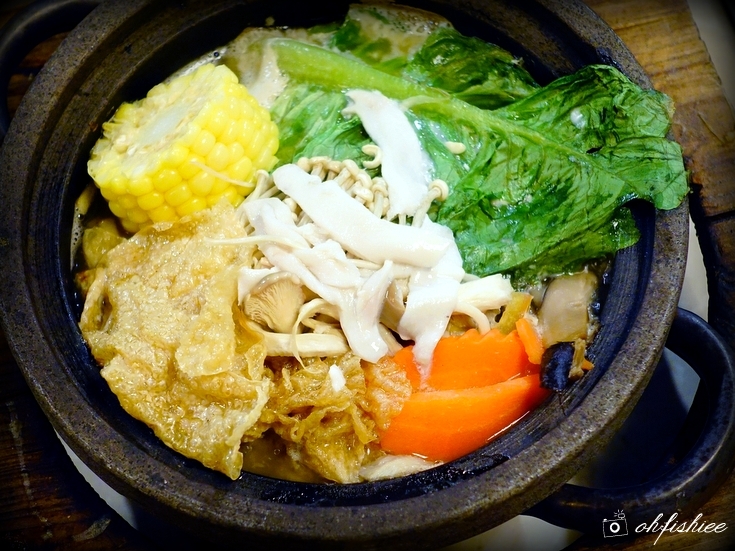 As for the food, first timers must try the No.1 Signature item here: Sauna Mee, served in a specially crafted claypot that keeps the broth warm to the very last sip! It is heated in a special oven for 50 minutes to be heated up to 250 degree Celsius. Seriously, it is piping hot upon being served, and the warmth lasts for more than 30 minutes. Indeed a hearty dish to warm the stomach! Come in a choice between vegetarian soup or fish soup, both are slow-cooked for over 5 hours, but I prefer the latter as it is more flavourful. 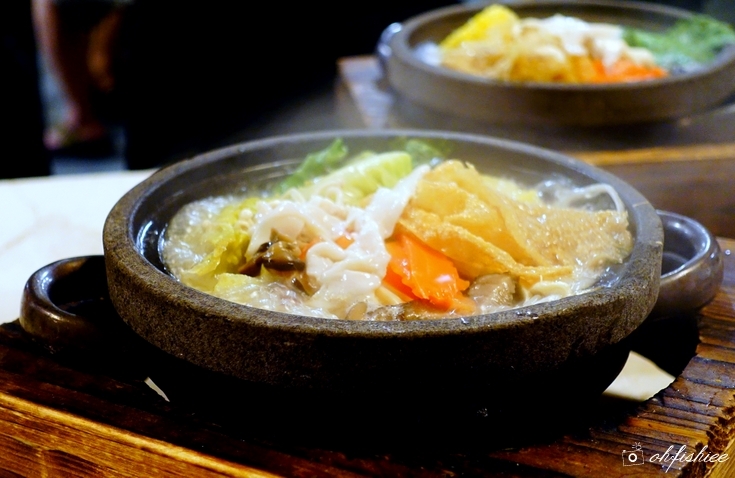 Apart from the common steamboat ingredients, the bowl is generously filled with handmade noodles-- Either crunchy Signature Rice Noodles or the soft and smooth Pumpkin Noodles. 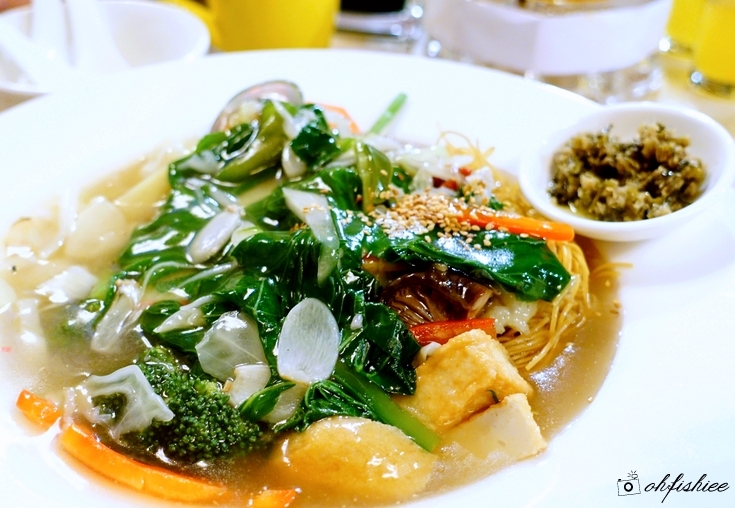 Other hearty meals such as the braised seafood noodles and rice set are equally noteworthy as they remind me of the taste from home. 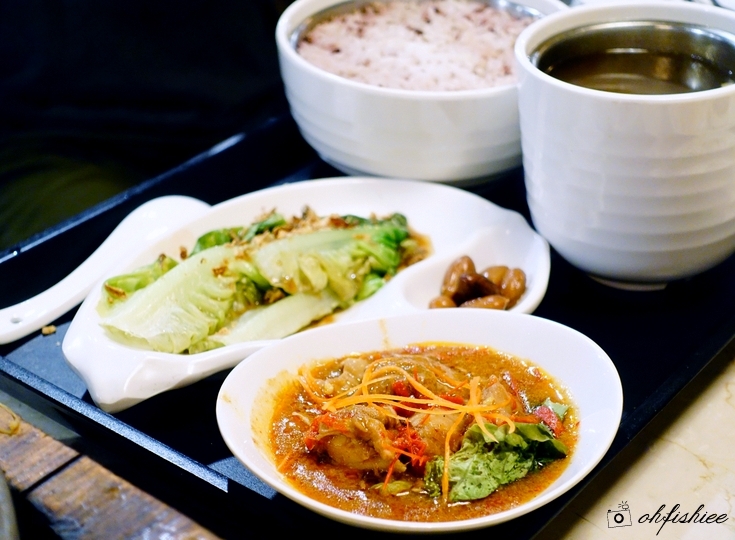 The generously portioned dishes are certainly not for those with small appetite; Sharing is highly recommended. If you think Mama Kim serves only Chinese dishes, then you're wrong because it also offers sandwiches, pasta, baked rice and chicken chop. 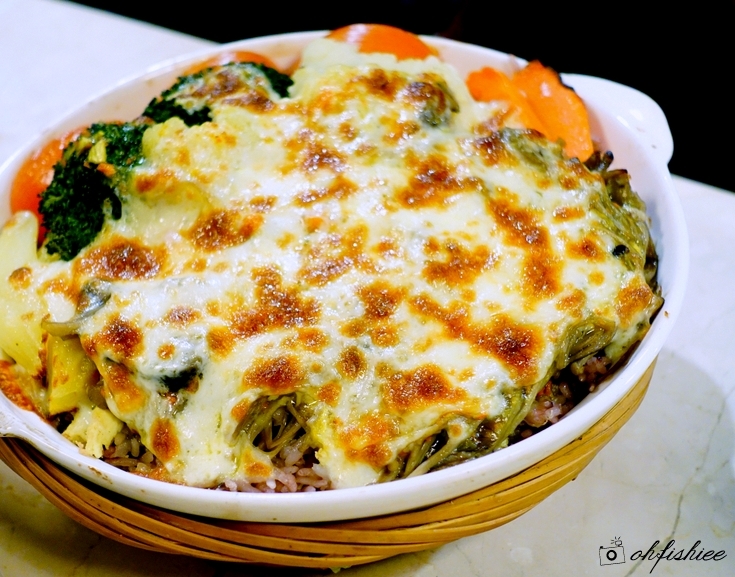 Sitting on a bed of brown rice, the melted cheesy mushroom forms a thick topping that is sure to whet our appetite. I'd wish the application of cheese is heavier though! Finally, it is the beautifully-presented fresh fruit salad that becomes our dessert of the evening. I am glad to conclude the sumptuous meal with such a sweet and crunchy treat without feeling sinful at all. 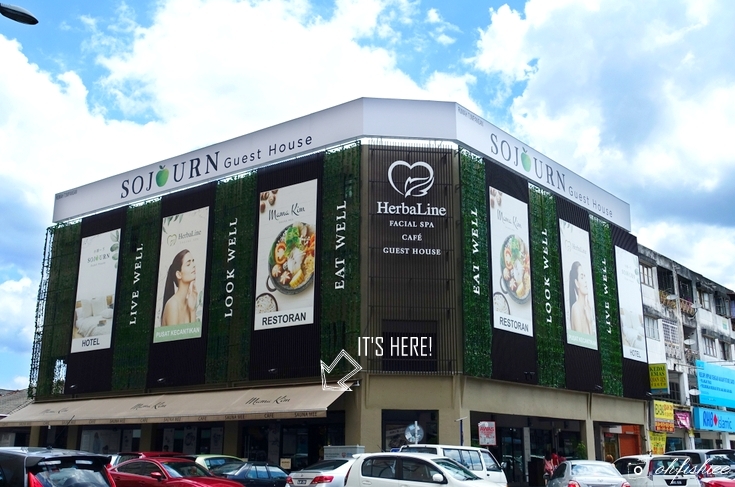 All Mama Kim outlets in Pandan Indah, Jalan Pahang and Kota Kemuning are attached with Herbaline Spa to complete our beauty and wellness journey, because “beauty does not only begin on the outside, but beauty also begins on the inside”. Wow! Healthy and yet not boring food choices!! I like! Will definitely keep this place in mind when I visit kl again. I love healthy food - that's why I usually reduce outside food. But this restaurant looks like they are serving the kind of food I make, only tastier! wow...this is a very interesting concept with all healthy food ,beauty, homestay .great to know it now. woohoo. one more healthy choice, this is music to my ear! :) love the sauna mee - the name and the food looks so special. unique name! sauna mee...the food look delicious healthy. Baked Cheesy Mushroom Rice attracts my taste bud. Looks like full house and I want to try also. Sauna mee!!! What a unique name hoho. The baked cheezy rice look yummy to me! I always love the way you do food photography. Simply awesome! Wow!!! Seriously?? Herbaline has their own restaurant? ahahaha... Love all the food you introduced. I shall check this out with few friends... Eat healthy is very important!